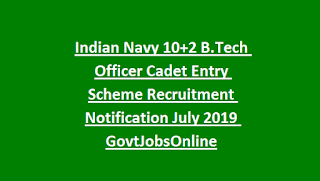 Indian Navy 10+2 B.Tech Officer Cadet Entry Scheme Recruitment-2018: Indian Navy invited online applications for the 10+2 B.Tech Engineering Course Commencing for the year July 2019 for the posts after completion of course Sub Lieutenant, Lieutenant, Lieutenant CDR and Commander. Selection for this 10+2 B.Tech Entry course will be held based on SSB personal interview which is conducted in various levels. Interviews will be conducted by the team of Permanent Commission for the candidates who are called on basis of JEE Mains Exam for interview. The young, Dynamic and talented candidates are invited to Join Indian Navy through 10+2 B.Tech Entry online applications. Last date for submitting applications online is on or before 22-11-2018. Selection for this 10+2 Entry of Indian Navy will be held through the SSB Interview. For more details regarding this Indian Navy 10+2 B.Tech Entry Scheme Recruitment notification please see the details given below. 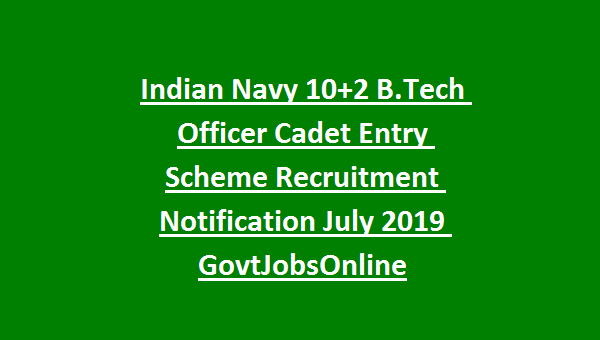 Click here to see the official notification of Indian Navy Recruitment for 10+2 B.Tech Cadet Entry Scheme. There are limited seats only for 10+2 B.Tech Entry Scheme available for the Lieutenant, Commander posts. On successful selection after fours of Degree Course candidates will be allotted to their respective ranks based on performance in training. Age limits are 17 to 19½ years (born between 02 Jan 2000 & 01 Jul 2002). Passed Intermediate/CBSE 12th class/Senior Secondary Examination (10+2 Pattern) or its equivalent examinations from any Board with at least 70% marks in Chemistry, Physics and Mathematics (Inter-MPC) and at least 50% in English (either in Class X or Class XII). No application fee for this Indian Navy Recruitment. Selection for this Indian Navy 10+2 B.TECH Entry will be held through SSB interview. SSB interview will be held in two stages and the process will took 4 days. Stage II Tests consists of Psychological Tests, Group Task Tests and Interview. Successful candidates will undergo medicals examination (approx 3-5 days). Height and Weight: Minimum 157 cms height and weight will be correlated. The candidates have to apply through online only using the official website of Indian Navy @www.joinindiannavy.gov.in. Click on Apply Online Officer and fill the necessary details and submit the application. After completion of online submission take printout of application. Click here to apply online for the recruitment of Indian Navy 10+2 B.TECH Entry Scheme..